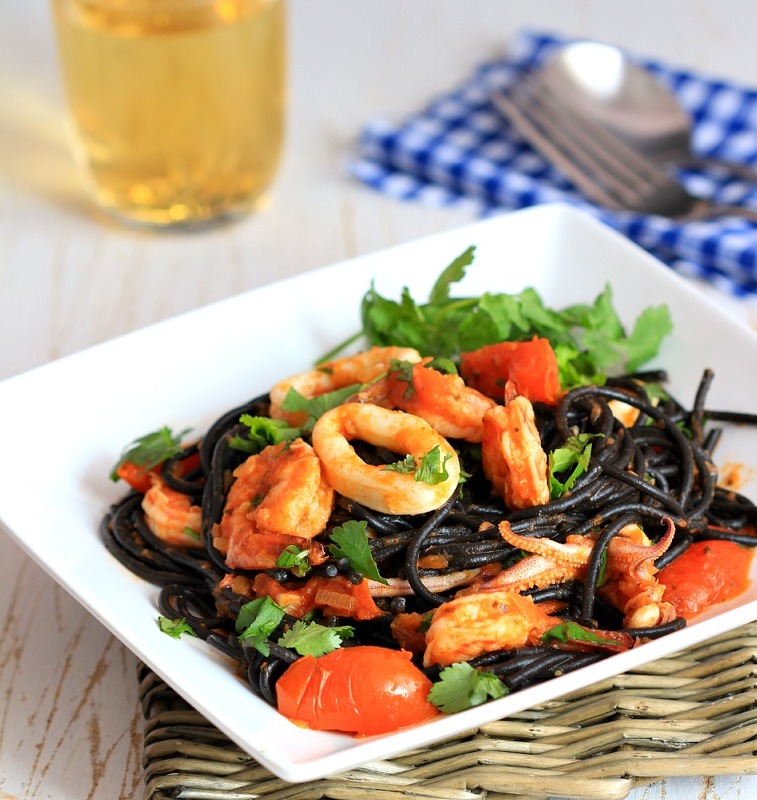 my bare cupboard: Seafood squid ink spaghetti "
Since I'll be hosting Little Thumbs Up event this month , now is the time to try the dried squid ink spaghetti that has been lurking in the kitchen since September . I asked , okay , more like threatened one of my fave Hongkongian to buy me this kind of pasta and parmigiano reggiano when they went to Italy last year or else .... You would have thought that I couldn't find those items here lol I've checked several recipes online and settled on Alvin's recipe which I've been eyeing since last month ! I like how easy it was to prepare , minimum effort with maximum flavor and cheap , too , compare to what you would pay , say , in an oceanfront resto with a glass of vino . You can make squid ink pasta at home and from what I've seen online , it's pretty easy as long as you can find a squid ink in your area and owning a pasta machine is a plus but you can do it by hand . Squid ink comes in liquid and powdered form or check out your local fishmongers or you can harvest it yourself - way cheaper , just collect enough ink sac but it's not for a faint-hearted . Cooking pasta is straightforward and quick and this dish is no exception - which most of us like when it comes to preparing home-cooked meals . 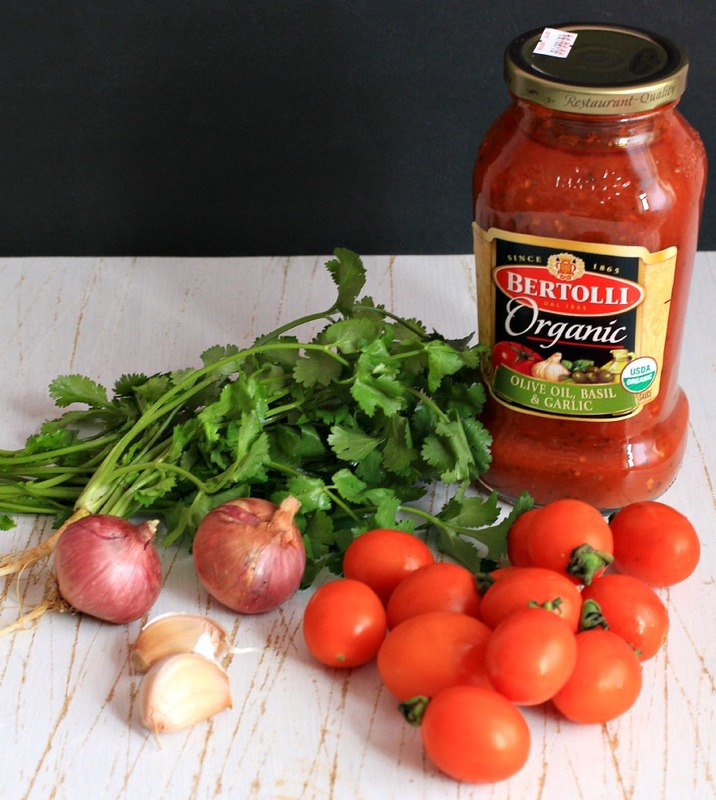 In my version , I substituted cilantro which is cheap and readily available for basil and used grape tomatoes because there are almost always grape and cherry tomatoes at the wet market . You can use any pasta you have on hand , heck , you can even just cook the sauce and served it with rice , that's me , the rice lover ! Slightly spicy with a subtle taste of the sea and saucy - the way I like my pasta , the gorgeous color of the noodles itself is picture-perfect read : easier to photograph heh ! 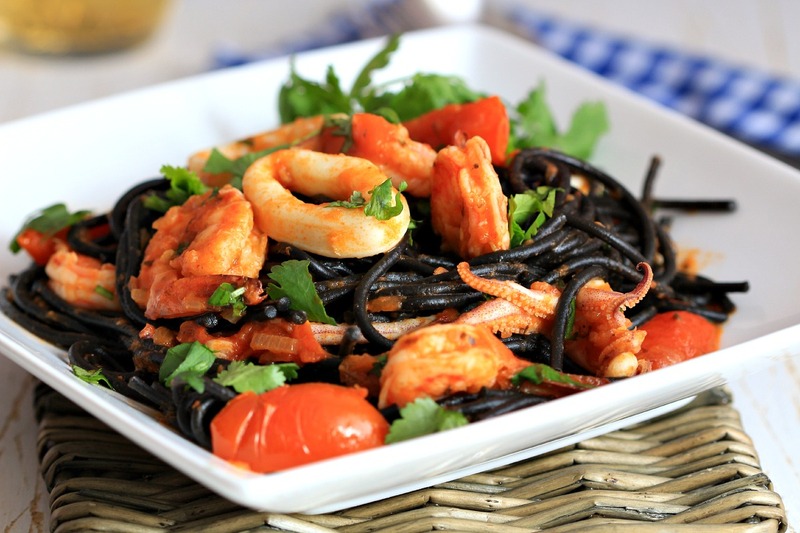 Have you tried squid ink pasta before ? * Cook pasta in a salted boiling water . * In a wok or a large skillet , pour in some olive oil , add in the shallots and garlic , stir-fry over medium heat for 3 minutes or until it turns lightly brown . Add in the sliced tomatoes and cook for another 2 minutes . Pour in the pasta sauce and broth then season with sugar , chili flakes , ground black pepper , Italian seasoning and chicken powder , let simmer over medium heat for 5 minutes , stirring from time to time . 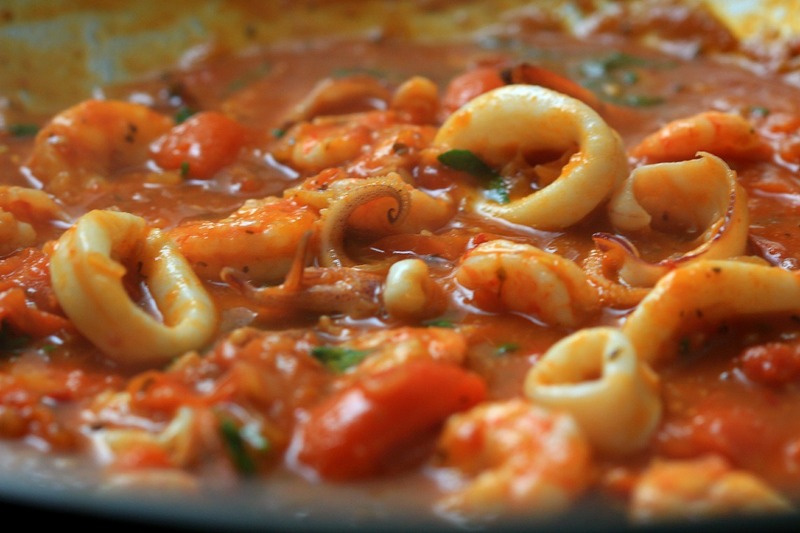 Add in the shrimp and squid , cook for 4 minutes , add in about two thirds of the cilantro and adjust seasoning , take pan off heat . * Drain pasta and add it into the pan , stir until well combined . Divide into 2 plates/bowls , sprinkle with remaining cilantro and serve immediately . Oh , take photos first , fast ! This post is linked to Little Thumbs Up , the theme for this month is Pasta / Noodles . This event is organized by Zoe of Bake for Happy Kids and Doreen of My Little Favourite DIY and me , Anne , is the host for this month's event . This is so DELICIOUS, Anne. Squid ink pasta is my favourite. I have not tried squid ink pasta before and i don't have friend who travel to Italy now. That is such a wonderful plate of pasta!! Hello Anne, this looks delicious! Looking fwd to join LTU this month.